As a guest of one of our Members, we hope you enjoy your time at our special club. Waccabuc is more of a club in the country than a country club. We hope you have time to take advantage of the golf course, tennis courts, waterfront and our delicious dining options. If you have any questions, please don't hesitate to ask any of the staff. To ensure a pleasant experience, please be aware of our policies outlined below. ​Cell phone use is restricted to the locker rooms and parking lots only. It is expected that Members, their family and guests will be suitably and neatly attired at all times while on the main Club premises. The main Club premises include the Clubhouse and all surrounding grounds, including those areas adjacent to the tennis courts and golf course. Separate dress codes apply to the Carriage House, Waterfront, tennis courts and golf course as described below. - Sunday - Friday evenings: Long pants are required for men (13 years old and up). - Saturday evenings: Jacket and long pants are required for men. - At other times: Appropriate "club casual" attire may be worn . - Saturday evenings: Jacket and tie are required for men. - At other times: Appropriate "club casual" attire may be worn. Other Clubhouse premises - Appropriate "club casual" attire may be worn. Club casual attire implies collared shirts (regular, mock and turtleneck) and pants or dress shorts for men, and comparable attire for women. Shirttails should be tucked in and belts worn. Dress sandals are allowed for women (men may wear dress sandals during the day only.) Members and their guests may also wear golf or tennis shoes and tennis attire on the Terrace, in the Tap Room, and in the Bar during lunch service. Unacceptable Attire: Excluded at all times from Clubhouse premises are denim in any form, souvenir tee shirts, men’s tank tops, very short shorts or skirts, cargo pants, cargo shorts, sweatsuits (shirts, pants or shorts), bare feet or bathing attire (bathing suits, flip-flops, sport sandals or shower slides). 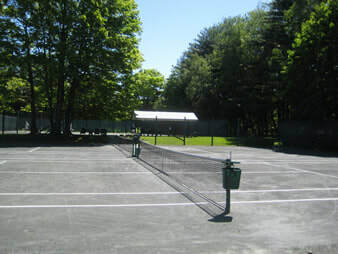 Tennis attire and athletic shoes may not be worn in the Clubhouse dining rooms or during the evening in the Bar or on the Terrace, with the exception of scheduled post event buffets. Ladies and gentlemen must remove sport hats, including baseball hats and visors, before entering the Clubhouse. Acceptable Attire: Appropriate golf attire is required on the golf course and on practice areas, such as golf shirts, slacks, skirts or Bermuda shorts. Shirttails must be worn in. Unacceptable Attire: Metal spikes, tennis attire, denim in any form, cargo shorts, athletic cleats and all other forms of unacceptable attire listed above for the Clubhouse and its premises, are not allowed. Acceptable Attire: White tennis attire is mandatory on the tennis courts at all times, including collared shirts for men, shorts, and tennis dresses. All tennis players must wear proper tennis shoes. Unacceptable Attire: All areas around the tennis courts are considered Clubhouse premises and fall under the guidelines listed above. Waterfront: There are no restrictions on attire at the Waterfront, although denim clothes are discouraged, especially for evening events such as Fire and Ice. Carriage House: Proper attire for the Carriage House varies according to the type of function taking place.